As I have mentioned before, we have to come up with 10 school lunches from 10 different countries that my kids have picked. One of the countries chosen was Japan. My daughter does not like to eat fish, but one of the only times that she will not complain about eating fish, is if there is sushi rice and seaweed involved. This is a very quick way of making sushi. I mix in salmon and grated carrots into the rice, making it a very balanced meal for lunch. Because it is shaped into triangles, it is also quick and easy to eat. I keep my seaweed in a ziplock bag in the freezer, once I have opened the seaweed packet. This keeps the seaweed fresh and it stays crunchy. 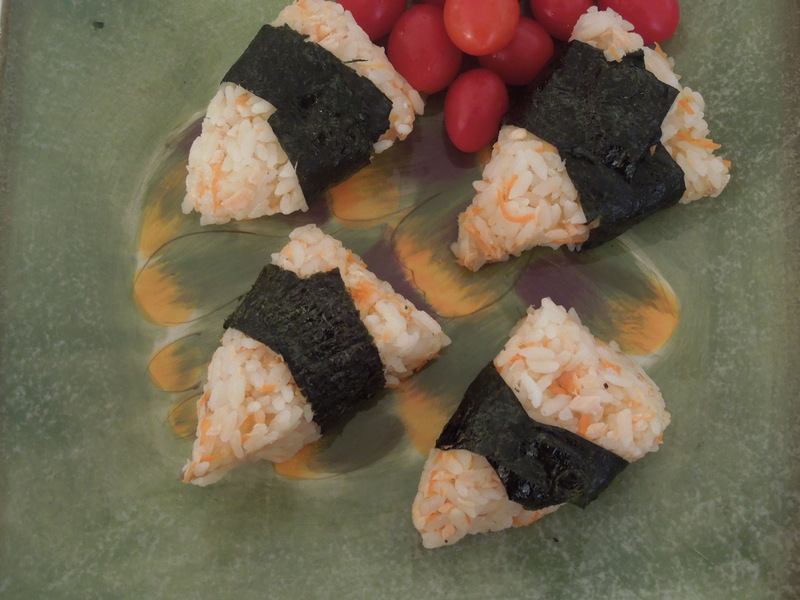 For school lunch, I pack the seaweed separately, as it gets soft if wrapped around the rice for a long time. The kids quite enjoy wrapping their triangles in pieces of seaweed. I usually give them bigger pieces of seaweed as they love seaweed. 1. Mix hot cooked rice with flaked salmon, grated carrots and vinegar. 2. I use a piece of clear wrap to form the sushi triangles. This makes things much neater. Place a mound of rice on the clear wrap. Press and form into triangles. 3. Wrap the sushi triangles with a piece of seaweed. Have you tried this with brown rice? No I have not. But it should be good.